I'm a bit shocked by my own mycophobia --- I almost threw away the first King Stropharia mushroom that popped up from our graywater mycoremediation project. This is our first year growing Stropharia rugosoannulata, but that's really no excuse. I was the one who researched and chose the species and personally inoculated the wood chips. But the mushroom that sprang up didn't look all that much like the pictures I'd quickly browsed on the internet, and I thought a wild fungus had invaded my mycoremediation project. After a more lengthy perusal of the internet (and my field guide to mushrooms), I decided this lovely specimen was indeed a King Stropharia. We ate it sauteed in garlic last night, so I assume I was right. Here are the top tips I've run across for King Stropharia identification. First, take a look at the ring around the mushroom's stem. Several other mushrooms have rings, but the ring on a King Stropharia mushroom has indentations from the gills along the top, giving it a lined appearance. 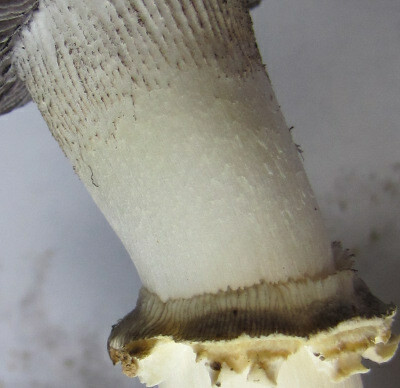 The lined ring is probably one of the most diagnostic features of King Stropharia. 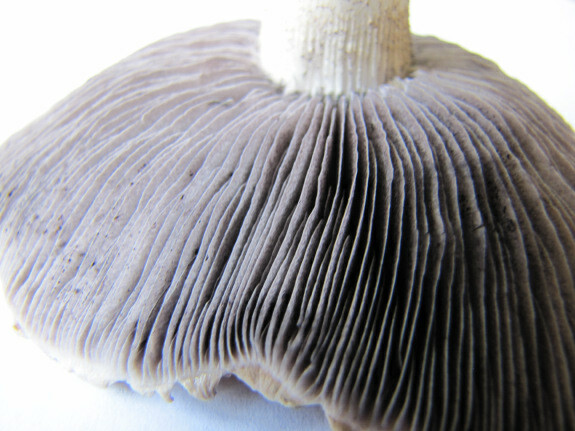 Next, take a look at the gills on the underside of the cap. Notice that they are attached to the stem and are a purply-gray in color. If the gills are free, then you might have an Agaricus, so beware! 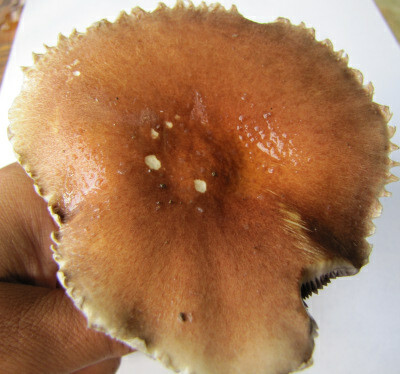 Some Agrocybe mushrooms can look similar too, but have brown gills. 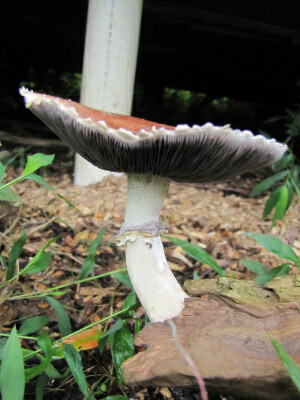 The top of the cap is often maroon in young specimens, but can also be plain old brown (especially as the mushroom ages), so cap color isn't so diagnostic. I find it interesting that our mycoremediation patch has fruited while the patches I inoculated at the same time under the canopies of nearby fruit trees have not. Clearly, the bit of bleach in the dishwater doesn't hurt King Stropharia one bit, and frequent soakings are a boon. Paul Stamets has written that King Stropharia mushrooms may actually depend on coliform bacteria for growth --- perhaps the bacteria going down the drain have helped our mycoremediation patch come out ahead? Our homemade chicken waterer prevents the leading cause of backyard chicken burnout --- filthy water. This is funny and it reminds me of when Seth and I grew our first baby lettuce. We KNEW what the lettuce was supposed to look like, and we KNEW that some of them were bitter, but every time we took a bite of it we were a little uneasy and we asked ourselves "Are we really eating lettuce and not some toxic weed that sprung up in the garden?" I even KNEW nearly all the weeds that could have grown up there, and logically I knew that this wasn't one of them. It was really silly to me that I had that kind of phobia of eating my own garden veggies. This was the first garden we grew and I thought I'd be a lot more confident, but I just couldn't ditch the doubt. Anyway, congrats one the mushroom growing and proper identification! We're hoping to start with mushrooms within the next year or so and if we plan to grow this species, this ID will definitely help us. Thanks. I had to be honest at one point and say "sis, I planted a lot of stuff and I have no idea what they look like so could we not pull weeds so quickly?"